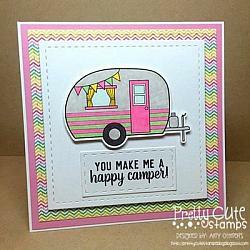 Home is where you park it.��This DIGITAL�set of 5�stamps features�three fun sentiments that go perfectly with camping images. �After purchase, a link to a zip file will be e-mailed to you. �Please double check your junk/spam folder if you don't receive the email quickly. Download links expire one week after purchase. You make me a happy camper!